Happy birthday to MEEEE! Gosh i'm officially a year older today and i'm 22! So much has happened after turning 21 last year that I can't believe a year has passed already! I set goals every year and I am so glad I have accomplished more than one could ever expect. I want to thank each and everyone of you who have stood by me, my blog and my Youtube Channel and have supported me and my work through-out it all. You have seen me move country, change and become an independent woman. I feel like each year, we all grow and become better or worse and in my case I have felt like i've evolved and become more independent and taking risks like no other. 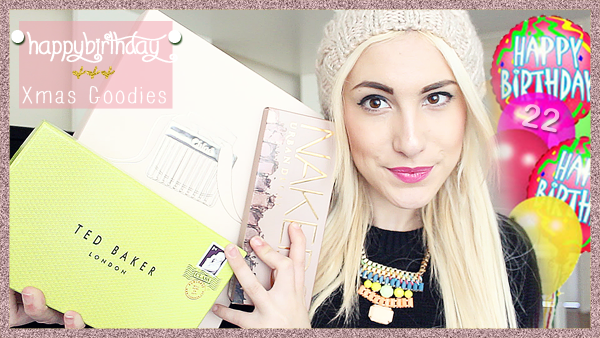 Today It's a video kinda day and I hope you have a lovely Sunday and enjoy watching what I got for Christmas and some goodies I bought myself aswell as some birthday gifts.